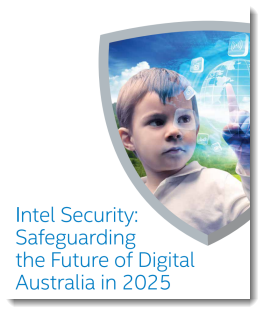 I have been recently working with McAfee, now part of Intel Security, to write a report on Safeguarding the Future of Digital Australia in 2025, being launched this morning in Parliament House in Canberra as part of the Federal Government’s Stay Smart Online Week. The report consists of my insights into the Future of Home, Social, Work, and GenNext in 2025, together with commentary from McAfee and other experts on how to keep safe in these worlds. Click on the report cover image left to download the report. Accompanying the report, we did a survey of what Australians think about their digital future in 2025. The results of the survey are in the video below. There are some fascinating insights. All the assets are on the Intel Security 2025 site. I’ll comment more on both the report and the survey results later this week. For now, please feel free to share the resources. I would love to hear your thoughts on the report. TECH SECURITY INFOGRAPHIC vimeo HD 1080.mp4 from McAfee APAC on Vimeo. I have been aware for some years of the various programming languages available for children. This evening I decided to have a go with Scratch with my daughters, as Leda is now almost eight, the bottom of the suggested age range for the language. I was blown away. Scratch has an extremely wide range of capabilities, ranging from very simple animations through to complex conditional loops, all done through extremely easy rearrangement of colored blocks. Any child would be immediately drawn into what they can do, and simply by playing, learn the principles of programming. Scratch’s originator MIT’s Mitch Resnick tells the story in this TED talk below. Yesterday I gave two keynotes at the Congreso Internacional de Retail in Lima Peru. The first keynote provided a big picture view of the changing world of business, while the second keynote focused on the future of retail. Here are the slides to my first keynote. The slides to the second keynote are here. As always, my slides are designed to support my presentations, not to stand alone, but may be useful to others. Do you have the passion of the explorer? If you do, what kind of employer could attract you away from entrepreneurship? Today the ever-inspiring John Hagel spoke in Sydney today about passion at work as part of AMP’s Amplify series, organized by Annalie Killian. https://rossdawson.com/wp-content/uploads/2016/07/rdawson_1500x500_rgb-300x100.png 0 0 Ross Dawson https://rossdawson.com/wp-content/uploads/2016/07/rdawson_1500x500_rgb-300x100.png Ross Dawson2014-02-14 10:39:552014-02-14 10:39:55Do you have the passion of the explorer? If you do, what kind of employer could attract you away from entrepreneurship? I have a very busy travel itinerary coming up, with keynotes scheduled on 5 continents in the next 4 months. While I often travel for a single engagement, I look where possible to fit in other client work when I am travelling. I currently have availability in Europe the week of March 10 before the Congres Intranet in Utrecht, Netherlands, which is apparently the largest intranet conference in the world, where I am running a pre-conference workshop on Tapping the Power of Internal Crowdsourcing and doing a keynote on The Future of Work and Organisations. Yesterday the West Australian newspaper began a five-part series on children and social media, beginning with a feature article introducing the topic. The article’s title, Get online or ‘be left behind’ quotes an interview with me. It is very easy for journalists to focus on the negative when covering children and social media, so I’m very glad they took a more balanced stance. Sydney-based Ross Dawson, founder of think tank Future Exploration Network, said social networking was still in its early days. “We’re still fairly early on into what will become simply communication – life as we know it,” he said. At the end of each year we share some thoughts about current trends and what to expect next year and beyond. Some of our past frameworks include Trend Blend 2007+, Trend Blend 2008+, Map of the Decade: 2010s, Zeitgeist 2011, 12 Themes for 2012, and 2013 – Life Next Year and Beyond: Appearing and Disappearing. Today Future Exploration Network launches our 2014: Crunch Time mini-report. It explains why we are reaching Crunch Time, the implications, descriptions of 14 domains in which we are hitting the crunch, and how we need to respond. The graphic slideshow of Crunch Time is embedded below. You can also read the full text in one page at 2014: Crunch Time on the original posting on the Future Exploration Network website.